In its early day, the clock was one of the most valued possessions in the home, not only as a status symbol, but as an instrument to measure the passage of time. Today we can receive a digital clock in the mail for free as an advertising promotion. How time has changed. In our fast paced life today there is a felt need to at times slow down and appreciate things that are outside the venue of faster and easier – to appreciate something that is made entirely by hand. To have something in your home that makes a connection to a simpler time. The original Arts & Crafts movement came to life as a response to the dehumanizing effects of the industrial revolution. The current Arts & Crafts revival offers a similar respite from the inundation of the information & technology revolution. 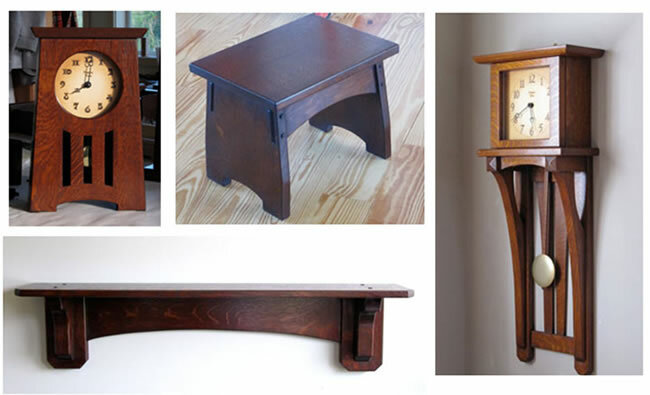 My inspiration comes from the pure aesthetic of the forward thinking modern design of the Arts & Crafts movement. In the “post modern” time in which we live, the beauty of the simplicity of the modern design of 100 years ago holds its value as pure design as much today as it did when it was conceived in the late 19th century. The designs are at home in either a traditional or contemporary home setting. I have always liked to make things. My schooling included a BFA degree in sculpture from Cal State Long Beach and an MFA degree in painting from Claremont Graduate School in 1982. I showed paintings with Roy Boyd Gallery in Chicago and Los Angeles. I taught drawing and painting at Antelope Valley College from 1983 to 1993. I had always had an interest in Arts and Crafts homes and design. In 1989 I was fortunate to purchase and work on the restoration of a Craftsman home in Highland Park, near Pasadena in Los Angeles. 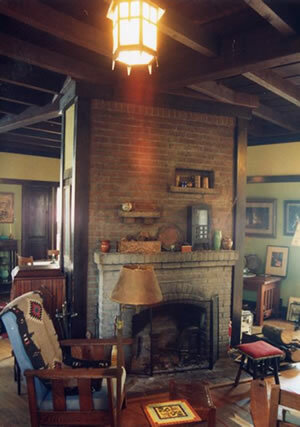 It was a most unique home built in 1912 for one of the professors of nearby Occidental College. Around that time I enrolled in the docent training program for the Gamble House taught by Randall Makinson nearby in Pasadena. This was a great opportunity to absorb so much about the Arts & Crafts design philosophy, learning about and spending time in the Greene and Greene masterpiece. My own home was a wealth of inspiration for me as well. It was around this time in 1992 that I started making clocks. 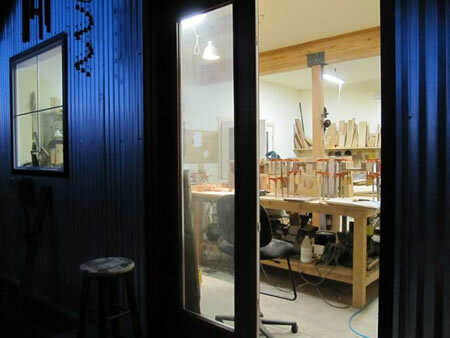 At the time I was working with a friend making custom furniture and I had access to plenty of quality scrap wood. 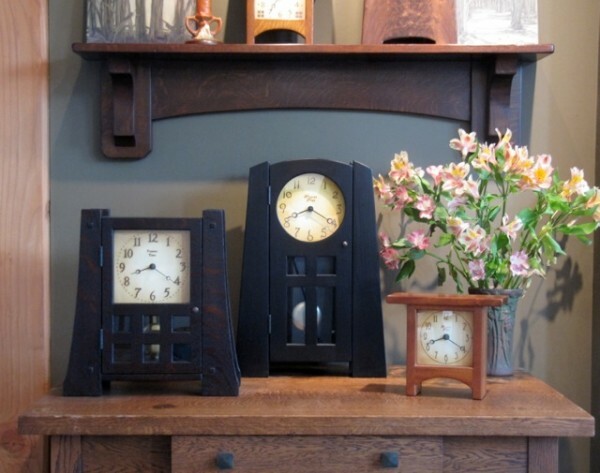 I had a couple of antique Arts & Crafts clocks that looked like they were probably home made, so why not try making my own? My first efforts relied on the limited dials available in the clock parts catalogs. I eventually figured out a way to realize my own dial designs, using a silkscreening and heat-embossing technique, that suited my clocks much better. In 1993 in pursuit of a simpler life, my partner and I left Los Angeles for the farmlands of Skagit Valley, Washington and an 1880’s farmhouse with a small shop where I developed my business. Fourteen years later I was able to sell the house and purchase 12 acres in Acme, Washington and build my own home and shop/studio. It was a life long dream and I was able to design every aspect of it myself. Although it is more “industrial farm style” than “craftsman”, I can’t help but feel an Arts & Crafts aesthetic in the space and it’s relation to the natural setting around it. I have been making clocks for more than twenty years now and as my surroundings have changed, I feel my work is changing and evolving too. I wish I had the time to build all of the design ideas in my sketchbook. I also find myself engaged in more custom work for repeat customers and branching out into accessories. I still produce all the clocks seen on this site, however if you have something else in mind, don’t hesitate to drop me an e-mail. To follow further adventures and developments in my journey, be sure to check out my blog “at the present time” and my facebook page “at the Present Time”. They will have the most up-to-date information.